New Delhi, February 5, 2013: The Ethiopian government has committed egregious human rights abuses to make way for agricultural land investments, in direct violation of international law, said the Oakland Institute in a new briefing paper released in New Delhi today. 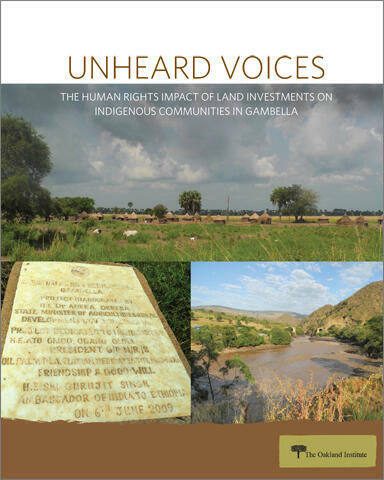 The briefing paper, entitled "Unheard Voices: The Human Rights Impact of Land Investments on Indigenous Communities in Gambella,” calls on Ethiopia to put an end to the illegal forced evictions of indigenous peoples in areas targeted for land investment. “Unheard Voices,” which builds on the Oakland Institute’s extensive in-country research on land investments in Ethiopia, also features testimony of two indigenous human rights defenders who have traveled to New Delhi to call on Indian investors to ensure that their investments respect human rights. Indian investors make up the majority of private investors in Ethiopian agricultural land. Obang Metho of the Solidarity Movement for a New Ethiopia and Nyikaw Ochalla of the Anywaa Survival Organization testified to the human rights abuses against Anuak community members in the Gambella region of Ethiopia, one of several regions targeted for land investment. Since 2010, the Ethiopian government has displaced hundreds of thousands of indigenous communities from their ancestral lands and has made these lands available to investors. This relocation process, which the Ethiopian government calls “villagization,” has destroyed livelihoods, rendering small-scale farmers and pastoralist communities dependent on food aid and fearful for their own survival. Ethiopian officials have also beaten, arrested, and intimidated individuals who have refused to comply with relocation policies. These actions are in direct contravention of Ethiopia’s obligations under international human rights law. The Ethiopian government has systematically failed to answer for these abuses, and continues to tout the infrastructure and service-related benefits of villagization—benefits that, by and large, have failed to materialize. Ensure the rights of indigenous peoples, including securing their free, prior and informed consent before enacting any development or investment-related plans that affect indigenous groups’ territories. Extend invitations to relevant U.N. Special Rapporteurs to conduct independent investigations into the abuses taking place in connection with land investments and the villagization process, thereby demonstrating the government’s commitment to human rights as a new member of the U.N. Human Rights Council. Respect human rights by ensuring that any applicable investments do not infringe on the human rights of indigenous peoples and other affected communities. Exercise due diligence by conducting impact assessments both prior to and during investment activity in order to mitigate and address potential adverse human rights impacts; and make these impact assessments publicly available. “Unheard Voices” was released ahead of an unprecedented gathering of Indian civil society groups who are coming together to share information on their own land-related struggles and address the prominent role of Indian investors in agricultural land investments in Ethiopia.